My work concentrates on metamaterials and novel types of optical fibres, including sensing schemes using photonic crystal fibres (optical fibres with holes running along their length), composite metal/glass fibres, plasmonics, non-linear optics and acoustic/optic interaction in composite media. Metal/glass composite fibres are a new avenue for mass-producing metamaterials – materials with properties emerging from their structure rather than from their constituents. Such fibres behave as homogenous material, but with electromagnetic properties arising from sub-wavelength metal structures with electric and magnetic resonances, that can be tuned by design. In particular the effective refractive index of such fibres can be positive, negative or even one (making the fibre invisible in air), or highly anisotropic behaving as a metal in one direction and a dielectric in another. The latter configuration in particular enables sub-diffraction limited imaging. In 2010, we published the first experimental demonstration of a metamaterial fibre, which we demonstrated to have effective plasmonic response at terahertz frequencies; we also demonstrated numerically that similar fibres could be made that are indeed invisible at optical wavelengths. We demonstrated drawn fibres with magnetic resonances at THz frequencies. Our current work concentrates on the exploration of new phenomena in structured fibre based metamaterials, their spatial dispersion and use for practical devices. As a first functional device, we have recently demonstrated deeply subwavelength imaging at THz freqeuncies using wire-array fibre and fibre taper, including focussing down to 1/27th of the wavelength and propagating sub-wavelength information over hundreds of wavelengths. Hyperbolic media are materials with effective electromagnetic properties radically different in different directions: typically they will behave as a metal in one direction and an insulator in another. As a consequence, light can propagate in these without diffraction, and evanescent wave can become propagative. 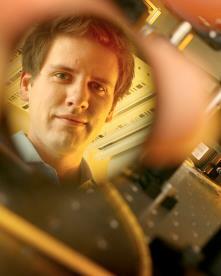 This enables new kind of lenses beating the diffraction limit. We have recently demonstrated magnifying and non-magnifying hyperlenses (endoscopes) using metal/polymer wire array fibres, with resolution better than 1/30th of the wavelength at THz frequencies. We are studying such hyperlenses both experimentally and theoretically. Metamaterials in principle enable an unprecedented control over electromagnetic waves, including confinement of light much below the diffraction limit. Metamaterials based sub-wavelength waveguides could provide a pathway to miniaturization of photonic circuits and THz optics and enhanced nonlinearities. Our programme concentrates on the theory of such waveguides as well as emerging devices based upon them. Boris Kuhlmey is an Australian Research Council Future Fellow with the School of Physics, The University of Sydney, with a continuing appointment as Senior Lecturer. After undergraduate studies at the École Normale Supérieure de Lyon, and a masters degree from the Institut d’Optique (Paris-Sud, Orsay, France) he was awarded a PhD jointly by the Université Aix Marseille III, France, and the School of Physics, University of Sydney, Australia, in 2003. During his PhD, he co-developed the multipole method for photonic crystal fibres (PCFs). In 2003 he joined the ARC Centre for Ultrahigh-bandwidth Devices for Optical Systems (CUDOS) at the University of Sydney, to work on modelling of photonic crystal fibres. In 2006 he was awarded an ARC fellowship for the theoretically study of solid core photonic bandgap fibres, followed by a continuing position as lecturer in 2009 and ARC Future Fellowship in 2010. He was Education and Training Director of CUDOS from 2007-2011 and became CI of CUDOS in 2011. His achievements have recently been recognised through a NSW Young Tall Poppy Science award by the Australian Institute of Policy and Science. His research on drawn metamaterial has attracted funding from the US Air Force’s Asian Office of Aerospace Research and Development, as well as from the Australian Research Council, from which he has secured several competitive grants. In total, Dr Kuhlmey has been awarded over 1.7M$ in research grants over the last 5 years. Boris is the author of the “CUDOS MOF Utilities,” the first free software dedicated to the simulation of PCFs, and co-authored the book “Foundations of Photonic Crystal Fibres,” now in its second edition. He has authored and co-authored over 55 publications in refereed journals, has served as invited editor for Physica B and as secretary and public officer for the international ETOPIM society (Electrical, Transport and Optical Properties of Inhomogeneous Media). He has served on organization committees for several national and international conferences and workshops, including ETOPIM 7 (Sydney, 2006) and Photonic Crystals: Fundamentals to Devices (Sydney 2005), and was programme chair and cochair for several local workshops and tutorial workshops. Over 77 refereed journal papers, 24 conference proceedings papers, 5 book chapters one book; for a full list see ISI Researcher ID link. X. Tang, B.T. Kuhlmey, A. Stefani, A. Tuniz, S.C. Fleming, and A. Argyros, "Electromagnetic Wave Propagation Through Air-Core Waveguide With Metamaterial Cladding," Journal of Lightwave Technology 34, p. 5317-5324 (2016). M.J.A. Smith, C. Wolff, C.M. de Sterke, M. Lapine, B.T. Kuhlmey, and C.G. Poulton, "Stimulated Brillouin scattering enhancement in silicon inverse opal waveguides," Opt. Express 24, p. 25148-25153 (2016). A. Alchalaby, R. Lwin, A.H. Al-Janabi, P.W. Trimby, S.C. Fleming, B.T. Kuhlmey, and A. Argyros, "Investigation of Plateau-Rayleigh Instability in Drawn Metal-Polymer Composite Fibers for Metamaterials Fabrication," Journal of Lightwave Technology 34, p. 2198-2205 (2016). F.J. Diaz, G. Li, C.M. de Sterke, B.T. Kuhlmey, and S. Palomba, "Kerr effect in hybrid plasmonic waveguides," Journal of the Optical Society of America B 33, p. 957-962 (2016). M.J.A. 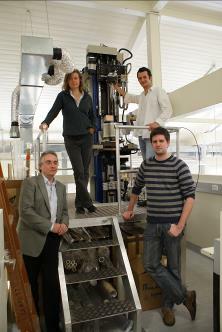 Smith, C. Wolff, C. Martijn de Sterke, M. Lapine, B.T. Kuhlmey, and C.G. Poulton, "Stimulated Brillouin scattering in metamaterials," Journal of the Optical Society of America B 33, p. 2162-2171 (2016). K.J. Kaltenecker, A. Tuniz, S.C. Fleming, A. Argyros, B.T. Kuhlmey, M. Walther, and B.M. Fischer, "Ultrabroadband perfect imaging in terahertz wire media using single-cycle pulses," Optica 3, p. 458-464 (2016). H. Li, S. Atakaramians, R. Lwin, X. Tang, Z. Yu, A. Argyros, and B.T. Kuhlmey, "Flexible single-mode hollow-core terahertz fiber with metamaterial cladding," Optica 3, p. 941-947 (2016). M.S. Habib, A. Tuniz, K.J. Kaltenecker, Q. Chateiller, I. Perrin, S. Atakaramians, S.C. Fleming, A. Argyros, and B.T. Kuhlmey, "Removing image artefacts in wire array metamaterials," Opt. Express 24, p. 17989-18002 (2016). S. Atakaramians and B.T. Kuhlmey, "Compact air-cavity resonators within a metamaterial waveguide," Opt. Lett. 41, p. 3379-3382 (2016). H. Li, G. Ren, S. Atakaramians, B.T. Kuhlmey, and S. Jian, "Linearly polarized single TM mode terahertz waveguide," Opt. Lett. 41, p. 4004-4007 (2016). M.J.A. Smith, B.T. Kuhlmey, C.M. de Sterke, C. Wolff, M. Lapine, and C.G. Poulton, "Metamaterial control of stimulated Brillouin scattering," Opt. Lett. 41, p. 2338-2341 (2016). F.J. Diaz, T. Hatakeyama, J. Rho, Y. Wang, K. O’Brien, X. Zhang, C. Martijn de Sterke, B.T. Kuhlmey, and S. Palomba, "Sensitive method for measuring third order nonlinearities in compact dielectric and hybrid plasmonic waveguides," Opt. Express 24, p. 545-554 (2016). Y. Zhao, C. Duncan, B.T. Kuhlmey, and C. Martijn de Sterke, "Phase matching in hyperbolic wire media for nonlinear frequency conversion," Opt. Express 23, p. 33733-33740 (2015). A. Tuniz and B.T. Kuhlmey, "Two-dimensional imaging in hyperbolic media–the role of field components and ordinary waves," Scientific Reports 5, p. 17690 (2015). X. Tang, Z. Yu, X. Tu, J. Chen, A. Argyros, B.T. Kuhlmey, and Y. Shi, "Elliptical metallic hollow fiber inner-coated with non-uniform dielectric layer," Opt. Express 23, p. 22587-22601 (2015). M.J.A. Smith, B.T. Kuhlmey, C.M. de Sterke, C. Wolff, M. Lapine, and C.G. Poulton, "Electrostriction enhancement in metamaterials," Phys. Rev. B 91, Article 214102 (2015). J.G. Hayashi, S. Fleming, B.T. Kuhlmey, and A. Argyros, "Metal selection for wire array metamaterials for infrared frequencies," Opt. Express 23, p. 29867-29881 (2015). J.S. Brownless, B.C.P. Sturmberg, A. Argyros, B.T. Kuhlmey, and C.M. de Sterke, "Guided modes of a wire medium slab: Comparison of effective medium approaches with exact calculations," Phys. Rev. B 91, Article 155427 (2015). C. Duncan, L. Perret, S. Palomba, M. Lapine, B.T. Kuhlmey, and C.M. de Sterke, "New avenues for phase matching in nonlinear hyperbolic metamaterials," Sci. Rep. 5, article 8983 (2015). M. Ebnali-Heidari, F. Koohi-Kamali, A. Ebnali-Heidari, M.K. Moravvej-Farshi, and B.T. Kuhlmey, "Designing tunable microstructure spectroscopic gas sensor using optofluidic hollow-core photonic crystal fiber," IEEE Journal of Quantum Electronics 50, p. 943-950 (2014). A. Tuniz, K.J. Kaltenecker, B.M. Fischer, M. Walther, S.C. Fleming, A. Argyros, and B.T. Kuhlmey, "Metamaterial fibres for subdiffraction imaging and focusing at terahertz frequencies over optically long distances," Nat Commun 4, p. (2013). O.T. Naman, M.R. New-Tolley, R. Lwin, A. Tuniz, A.H. Al-Janabi, I. Karatchevtseva, S.C. Fleming, B.T. Kuhlmey, and A. Argyros, "Indefinite media based on wire array metamaterials for the THz and mid-IR," Advanced Optical Materials 1, p. 971-977 (2013). A. Tuniz, R. Lwin, A. Argyros, S.C. Fleming, and B.T. Kuhlmey, "Fabricating metamaterials using the fiber drawing method,"J. Vis. Exp. (68), e4299, doi:10.3791/4299 (2012). A. Tuniz, B. Pope, A. Wang, M.C.J. Large, S. Atakaramians, S.S. Min, E.M. Pogson, R.A. Lewis, A. Bendavid, A. Argyros, S.C. Fleming, and B.T. Kuhlmey, "Spatial dispersion in three-dimensional drawn magnetic metamaterials," Opt. Express 20, p. 11924-11935 (2012). N. Singh, A. Tuniz, R. Lwin, S. Atakaramians, A. Argyros, S.C. Fleming, and B.T. Kuhlmey, "Fiber-drawn double split ring resonators in the terahertz range," Opt. Mater. Express 2, p. 1254-1259 (2012). V. Pureur and B.T. Kuhlmey, “Higher-order core-guided modes in two-dimensional photonic bandgap fibers,” J. Opt. Soc. Am. B 29, p. 1750-1765 (2012). S. Atakaramians, A. Argyros, S.C. Fleming, and B.T. Kuhlmey, "Hollow-core waveguides with uniaxial metamaterial cladding: modal equations and guidance conditions," J. Opt. Soc. Am. B-Opt. Phys. 29, p. 2462-2477 (2012). R.C. McPhedran, I.V. Shadrivov, B.T. Kuhlmey, and Y.S. Kivshar “Metamaterials and Metaoptics,” Nature Publishing Group Asia Materials, NPG Asia Mater. 3(9) 100–108 (2011) . A. Wang, A. Tuniz, P.G. Hunt, E.M. Pogson, R.A. Lewis, A. Bendavid, S.C. Fleming, B.T. Kuhlmey and M.C. J. Large, “Fiber metamaterials with negative magnetic permeability in the terahertz,” Optics Materials Express 1, pp.115-120 (2011); Featured in Nature Photonics research highlights: Nature Photonics 5, 382–383 (2011). D. K. C. Wu, B. T. Kuhlmey, and B. J. Eggleton, "Ultrasensitive photonic crystal fiber refractive index sensor," Opt. Lett., 34, pp. 322-324, (2009). B. T. Kuhlmey, B. J. Eggleton, and D. K. C. Wu, "Fluid-Filled Solid-Core Photonic Bandgap Fibers," Journal of Lightwave Technology, 27, pp. 1617-1630, (2009). D. Y. T. Liu, B. T. Kuhlmey, P. M. C. Smith, D. A. Day, C. R. Faulkner, and R. L. Overall, "Reflection across plant cell boundaries in confocal laser scanning microscopy," Journal of Microscopy, 231, pp. 349-357, (2008). B. T. Kuhlmey, K. Pathmanandavel, and R. C. McPhedran, "Multipole analysis of photonic crystal fibers with coated inclusions," Opt. Express, 14, pp. 10851-10864, (2006). B. Kuhlmey, G. Renversez, and D. Maystre, "Chromatic dispersion and losses of microstructured optical fibers," Applied Optics, 42, pp. 634-639, (2003). G. Renversez, B. Kuhlmey, and R. McPhedran, "Dispersion management with microstructured optical fibers: Ultraflattened chromatic dispersion with low losses," Opt. Lett., 28, pp. 989-991, (2003). T. P. White, B. T. Kuhlmey, R. C. McPhedran, D. Maystre, G. Renversez, C. M. De Sterke, and L. C. Botten, "Multipole method for microstructured optical fibers. I. Formulation," J. Opt. Soc. Am B, 19, pp. 2322-2330, (2002). B. T. Kuhlmey, T. P. White, G. Renversez, D. Maystre, L. C. Botten, C. M. De Sterke, and R. C. McPhedran, "Multipole method for microstructured optical fibers. II. Implementation and results," J. Opt. Soc. Am B, 19, pp. 2331-2340, (2002). B. T. Kuhlmey, R. C. McPhedran, C. M. De Sterke, P. A. Robinson, G. Renversez, and D. Maystre, "Microstructured optical fibers: Where's the edge?," Opt. Express, 10, pp. 1285-1290, (2002). B. T. Kuhlmey, R. C. McPhedran, and C. Martijn de Sterke, "Modal cutoff in microstructured optical fibers," Opt. Lett., 27, pp. 1684-1686, (2002). Foundations of Photonic Crystal Fibres, F. Zolla, G. Renversez, A. Nicolet, B. Kuhlmey, S. Guenneau, D. Felbacq, Imperial College Press, London (2005) (343 pages). Foundations of Photonic Crystal Fibres, second edition, F. Zolla, G. Renversez, A. Nicolet, B. Kuhlmey, S. Guenneau, D. Felbacq, A. Argyros, S. Leon-Saval, Imperial College Press, London (2012) . P. Domachuk, P. Steinvruzel, B. Kuhlmey and B. J. Eggleton, Optofluidic Photonic Crystal Fibres, Properties and Applications, Chapter 7 of “Optofluidics: Fundamentals, Devices, and Applications,” Yeshaiahu Fainman, Luke Lee, Demetri Psaltis and Changhuei Yang, Editors, McGraw-Hill Professional (2009) pp.133-176. L. C. Botten, R. C. McPhedran, C. M. de Sterke, N. A. Nicorovici, A. A. Asatryan, G. H. Smith, T. N. Langtry, T. P. White, D. P. Fussell, B. T. Kuhlmey, “From Multipole Methods to Photonic Crystal Device Modelling,” Chapter 2 of “Electromagnetic Theory and Applications for Photonic Crystals,” Ed. K. Yasumoto, CRC Press Inc. (2005), 73 pages. A. Nicolet, S. Guenneau, F. Zolla, C. Geuzaine, B. Kuhlmey, G. Renversez, “Numerical investigation of photonic crystal fibers by spectral and multipole methods,” IUTAM Symposium on Asymptotics, Singularities and Homogenisation in Problems of Mechanics, A. B. Movchan, Editor, Kluwer Academic Publishers (2003), pp. 23–32. B. T. Kuhlmey, G. Renversez, D. Maystre, “Photonic crystals: modal theory of PC optical fibers and numerical application,” Progress in Analysis: Proceedings of the 3rd International ISAAC Congress, H. G. W. Begehr, R. P. Gilbert, M.W. Wong, Editors, pp. 1327–1335. (World Scientific Press, Singapore, 2001). Workshop on Metamaterials of Annual International Conference “Days on Diffraction-2013” St. Petersburg, Russia, 2013, OECC 2012, ECOC 2012, CLEO 2012, IPC2012, Photonics West 2012, ACOFT/Australian Institute of Physics Conference 2012 (Sydney, NSW), IRMMW 2012 (Wollongong, NSW), Metamaterials 2011 (October 2011), Asia Communications and Photonics Conference and Exhibition (Shanghai, 2009), Optical Fibre Sensors (Edinburgh 2009) 1st Workshop on Speciality Optical Fibres (Sao Pedro, Brazil, 2008), Dodd-Walls Symposium (Queenstown, New Zealand, 2008), OECC/ACOFT 2008 Conference (Sydney, Australia, July 2008), ICMAT’07, Singapore, July 2007, European Symposium on Optics and Optoelectronics (EEC), (Prague, April 2007), SPIE Microtechnologies for the New Millennium, Sevilla, Spain 2005, SPIE Photonics West, San Jose, California, USA, January 2004, IEEE LEOS Summer Topical Meeting Series 2003 – Holey Fibers and Photonic Crystals, Vancouver, British Colombia, Canada, July 2003; Invited seminar at the School of Physics, University of Auckland 2007.